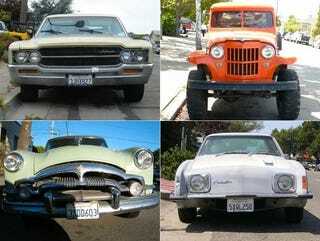 We're actually up to 482 Alameda street-parked classics in this series, but I'm still working on chronicling the 450-machine milestone. The Server Hamsters resist in all their maddened rodential fury, but we press on! So, in an attempt to get the 450 DOTS Celebration to show up on your computer, I'm breaking it up into sections. We've had the Germans and the Wagons, and today I've been so inspired by the beautiful DOTS '69 AMX that I've put together a collection of Alameda's street-parked vintage American cars and trucks that were not designed by Detroit's Big Three (I say "designed" because I think that the '45 Jeep counts as a Willys, in spite of being built by Ford). I believe that the trio of kit cars, the Shay Model A, the CMC Gazelle, and the Fieroborghini- based on Pinto, Chevette, and Fiero chassis, respectively- qualify here, because, well, why not? You Scout fans will find plenty of iron to admire, we've got some Ramblers and a couple of Studes, and there's even a Packard!